↑ Finlay, C. C.; Maus, S.; Beggan, C. D.; Bondar, T. N.; Chambodut, A.; Chernova, T. A.; Chulliat, A.; Golovkov, V. P.; Hamilton, B.; Hamoudi, M.; Holme, R.; Hulot, G.; Kuang, W.; Langlais, B.; Lesur, V.; Lowes, F. J.; Lühr, H.; Macmillan, S.; Mandea, M.; McLean, S.; Manoj, C.; Menvielle, M.; Michaelis, I.; Olsen, N.; Rauberg, J.; Rother, M.; Sabaka, T. J.; Tangborn, A.; Tøffner-Clausen, L.; Thébault, E.; Thomson, A. W. P.; Wardinski, I.; Wei, Z.; Zvereva, T. I. (December 2010). "International Geomagnetic Reference Field: the eleventh generation". Geophysical Journal International. 183 (3): 1216–1230. Bibcode:2010GeoJI.183.1216F. doi:10.1111/j.1365-246X.2010.04804.x. ↑ Chulliat, A.; Macmillan, S.; Alken, P.; Beggan, C.; Nair, M.; Hamilton, B.; Woods, A.; Ridley, V.; et al. (2015). 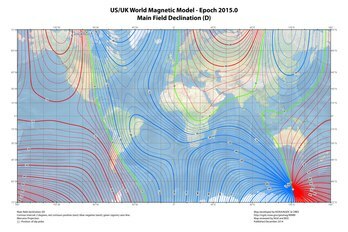 ﻿The US/UK World Magnetic Model for 2015-2020﻿. National Geophysical Data Center. http://www.ngdc.noaa.gov/geomag/WMM/data/WMM2015/WMM2015_Report.pdf. Retrieved on 21 ਫ਼ਰਵਰੀ 2016.